An Association – Sucka Punch! I have an association with Pulp21. I’m their cat herder. As such, it means that I’m the guy who is suppose to keep them on track with story ideas and doing actual work. The three of us have admittedly been rather slack with our output over the last few years. This year, things changed. Chet and Richard have both produced a story that was placed in a comic and hawked at the New York Comicon. They told me that when the next thing comes out, I’m allowed to have some of my work in the book. That means that I have to start working on stories. And I am. 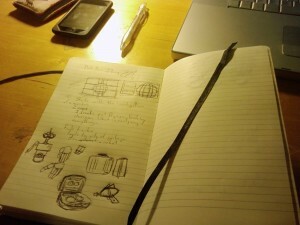 There are four sizes of sketch/notebooks that I use to keep ideas and notes to myself down on. Thankfully I have enough presence of mind to understand what I’m talking about in these little bastards. But there are starting to come in real handy as I write more and more story ideas and scratches for designs to later refine. With the ideas being placed down, now it’s time to start weaving a story. Or in my case, since a lot of theses ideas can’t touch each other, stories. So far there are four concrete ideas that want to be told. And one happens to be zombie story. I know they’re played out, but this is one that I’ve wanted to tell for at least 8 years now. It’s not a bad story and it’s not a good story, but it has something to say and it’s at the low end of the scale so more then likely, it won’t be told until zombies make a revival again. Until then there are a few more stories to write down. No good guys or bad guys, just guys with problems.